Love Your Life, a new campaign with images by Duane Cramer. Black women and Latinas will be seeing more positive, culturally familiar images associated with HIV prevention and treatment in New York City around Harlem and the Queens neighborhood of Jackson Heights, as well as in Central New Jersey, starting on March 10, 2017. 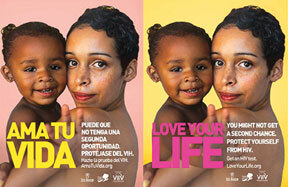 On that day, National Women and Girls HIV/AIDS Awareness Day, the bilingual social marketing campaign Love Your Life will debut in those areas. Following in the footsteps of the Let’s Talk About PrEP and PrEP for Her campaigns, Love Your Life encourages women of color to become active in protecting their sexual health. Despite recent improvements in rates of new HIV infection, both Black women and Latinas disproportionately experience HIV. In 2014 in New York City, 66 percent of total HIV diagnoses among women occurred among Black women, while 25 percent occurred among Latinas/Hispanic women, according to the New York Department of Health and Mental Health. What’s more, 45 percent of all people newly diagnosed with HIV in New York City between 2010 and 2014 were Black and 33 percent were Hispanic/Latino. On World AIDS Day in 2015, New York City Mayor Bill de Blasio announced an ambitious plan to end the AIDS epidemic in his city by the year 2020. The Love Your Life campaign supports this goal. Conceived by Duane Cramer Creative and spearheaded by Iris House and Voces Latinas, Love Your Life projects bright, colorful and uplifting images of Black women and Latinas to embolden and inspire them to put their wellness first. Iris House—the first nonprofit in the United States to focus on women and HIV, with locations in Harlem and Plainfield, N.J.—has been serving women of color since 1992. Executive Director Ingrid Floyd says that Black women and Latinas have been neglected in the messaging surrounding HIV prevention and services. “Over the last few years, the focus of a lot of services has been on young, Black gay men. We don’t negate that there’s a need to focus on them, but we still need help among women of color because the rates of infection are still high. So this campaign focuses on helping women of color understand that they also need to get tested,” she says. Voces Latina serves monolingual Spanish-speaking immigrant women who struggle not only to obtain health care but also with their immigrant status. Since 2003, the nonprofit has been assisting Latinas around Jackson Heights. Executive Director Nathaly Rubio-Torio says that this campaign reflects what matters to Latina women. Both executive directors agree that Black women and Latinas value their families and put them first, even over their own health. Candace Y.A. Montague is an award-winning freelance journalist in Washington, D.C. Her work has been featured in several online and print publications.